Historically, installation of Nagios on a Raspberry Pi has been somewhat ‘problematic’. The reason being that while Nagios has been compiled to work with a wide range of different computer types, installation onto the ARM architecture used by the Pi has not been common. There has been good work done to pre-compile and distribute images for use, but in may cases these do not support the later versions of Raspbian and they take some of the ‘mystery’ and learning away from the process. What follows is heavily drawn from the good work of Farooq Mohammed Ahmed who has been a stalwart of a range of open source topics including the Raspberry Pi and Nagios. In this case the use of the -i option not only allows us to use the shell with root privileges, but it also acquires the root users environment. We need to download and install the required packages via apt-get install. We will be informed of the additional packages that will also need to be installed and asked to agree to the process. Once we agree it will start and work its way through the various applications. Then we need to create a ‘nagios’ user using useradd and then set the password using passwd (choose something appropriate and note it down somewhere). Now we create a group ‘nagcmd’ (using groupadd) to facilitate external commands via the Web User Interface and then add both Nagios (‘nagios’) and Apache (‘www-data’) users to it with the usermod command. Now we can download Nagios Core and associated plugins using wget to the /tmp directory. The latest current versions are Nagios 4.1.1 and Nagios Plugins 2.1.1. We’ll do this in the /tmp directory to keep out of the way of the rest of the system during the installation (hence the cd into /tmp). Nagios Core is the primary application that acts as a monitoring and alerting engine for Nagios. It serves as the basic event scheduler, event processor, and alert manager for monitored elements. It features several APIs that are used to extend its capabilities and perform additional tasks. 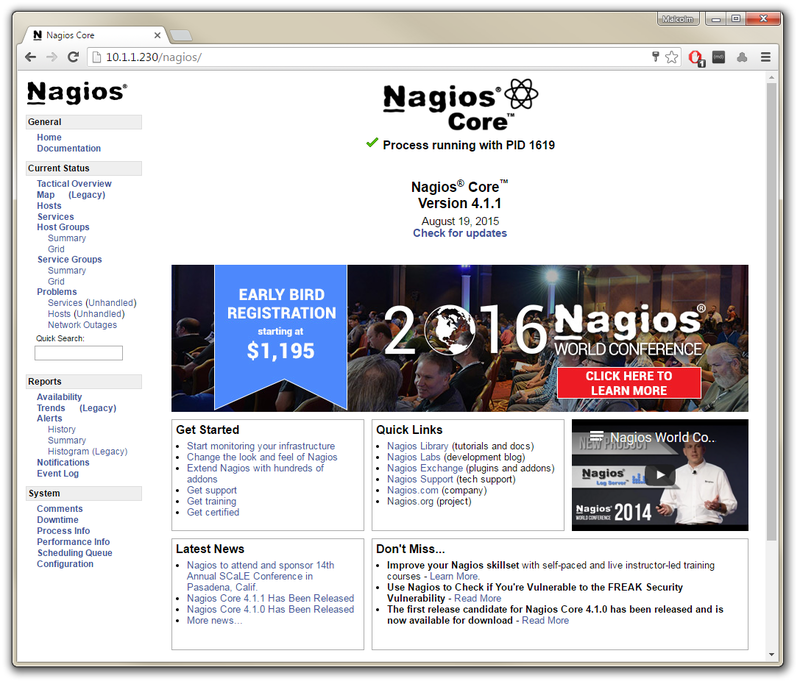 The Nagios plugins are around 50 ‘official’ standalone extensions to Nagios Core. They act to extend monitoring capabilities by processing command-line arguments, performing a specific check, and then returning the results to Nagios Core. Now we’re going to compile the source and install it. All the files from this process will go into /usr/local/nagios/ directory. This process will whistle through a considerable amount of processing and then display a configuration summary. As the final portion of the output states, assuming that the configuration looks OK we can then go ahead and start the make process. This will carry out the process of building the executable programs and libraries from the available source code. This is a complex process that will take some time to complete (especially on a ‘Pi’) so prepare to be patient while it works through the required computation. Now we can create a user and a password to use to access the Nagios Web User Interface via the Apache HTTP server. The name ‘nagiosadmin’ used below can be substituted for an alternative if desired. We will be prompted (twice) for a new password for the ‘nagiosadmin’ user. Note it down somewhere appropriate. Per the final line, it looks as if everything has gone smoothly. Now we can create a nagios.service file with the file editor ‘nano’ (or the editor of your choice) with the following content. This will allow us to start and stop Nagios in a standardised way. If no errors are reported then we can start the Nagios service. Mar 26 14:33:15 raspberrypi nagios: nerd: Fully initialized and ready ...! We are now ready to access the Nagios Web User Interface. We can do this by using the static IP address that we set up for our Pi at the following URL http://10.1.1.230/nagios. This can be accessed from a machine (our Windows desktop for example) by simply typing it into the browser. Without any issues I was able to follow your guide. Now for me to see what I can do with Nagios. I am trying to run the commands but when i authenticate i get an internal server error what is that i am not doing correct. I'm not sure what would be causing the problem. The best I could recommend is to re-try the installation and see if there is something different in the process that might be causing the problem. The requested URL /nagios/< was not found on this server. Hi. That would tend to indicate that the web server is running, but for some other reason the Nagios page isn't operative. I can't really suggest why unfortunately. Try a repeat of the install and see if the problem is consistent. Works great for me! Thanks for the guide! That is all you need. It writes the Config to /etc/apache2/sites-enabled/nagios.conf. The Path under /etc/httpd/conf.d is old and inactive stuff. Thanks! That's a great link and the good news is that Ubuntu appears to auto translate it :-). I should clearly go through the instructions and update them.